The following are provided from correspondence between the Cowell family in USA and Miss Joyce Winmill in 1976. James Yarrow born 12 March 1823 and Mary Reed born 8 March 1826 in Henham. 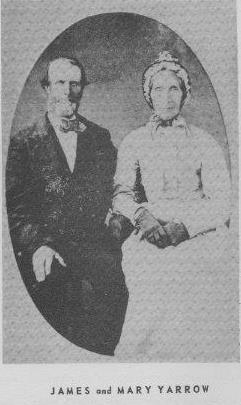 They were married in Henham on 23 Sept 1843 witnessed by Isaac Smith and Benjamin Little. 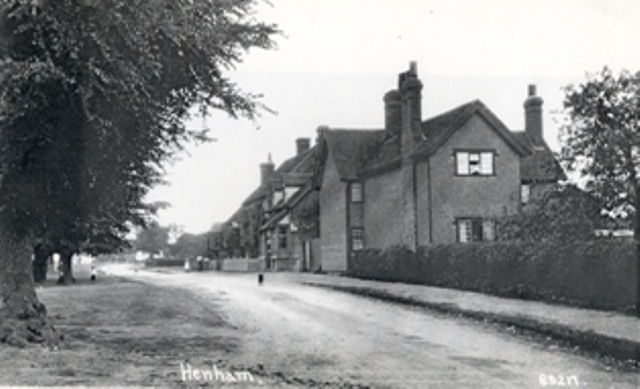 By the 1851 census they were living in Henham. 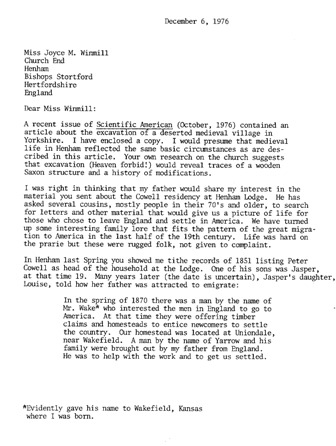 James was an agricultural labourer. 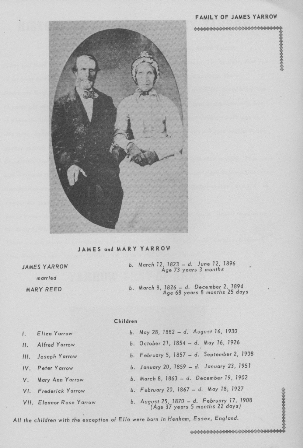 They had three children James aged 6 scholar (died 5 Oct 1852), Charles aged 4 (died 14 Mar 1852) and Elizabeth aged 1 (died 22 Feb 1853 referred as Betsy). Eliza (born 28 May 1852), Alfred (born 21 Oct 1854), Joseph (born 5 Feb 1857), Peter (born 20 Jan 1859). 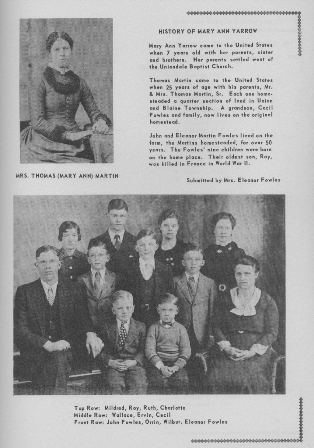 In 1870 the family which had now increased to include Mary Ann (born 8 Mar 1863) Frederick (born 20 Feb 1867), move to Kansas USA, where Eleanor Rose is born 25 Aug 1870. The journey to USA started by travelling from Henham, Essex to Kansas as part of the migration of the early 1870s. A man by the name of Mr Wake? interested the men of England to travel to America. 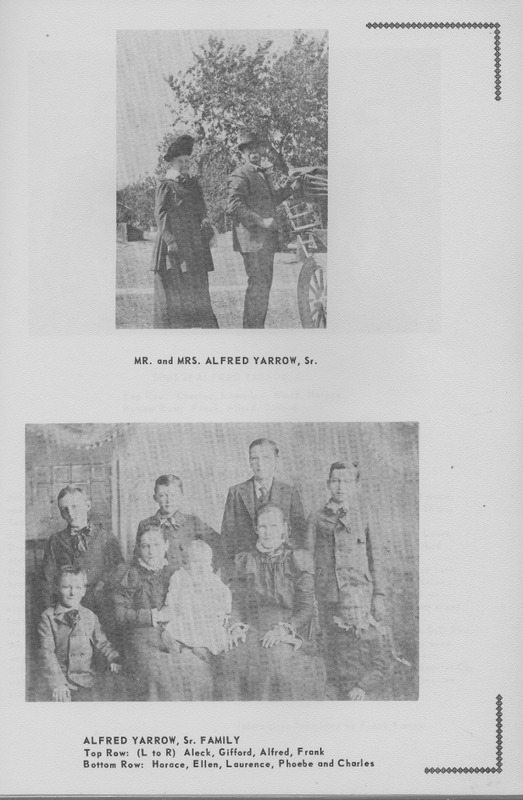 The Yarrow family were labourers for Mr Cowell of Henham Lodge and Mr Cowell brought the Yarrow family over. The 1880 USA census shows that James is now a farmer in Junction City, Davis, Kansas. There is a suggestion that other Yarrow family members had already travelled to Kansas. 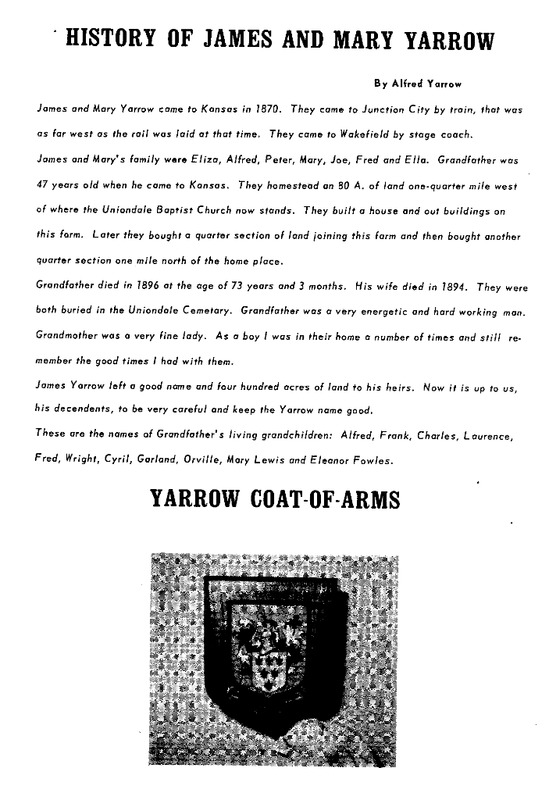 The grandson who wrote the story of James states that James and the family arrived in Junction City Kansas by rail and used the stage coach to get to Wakefield Kansas. 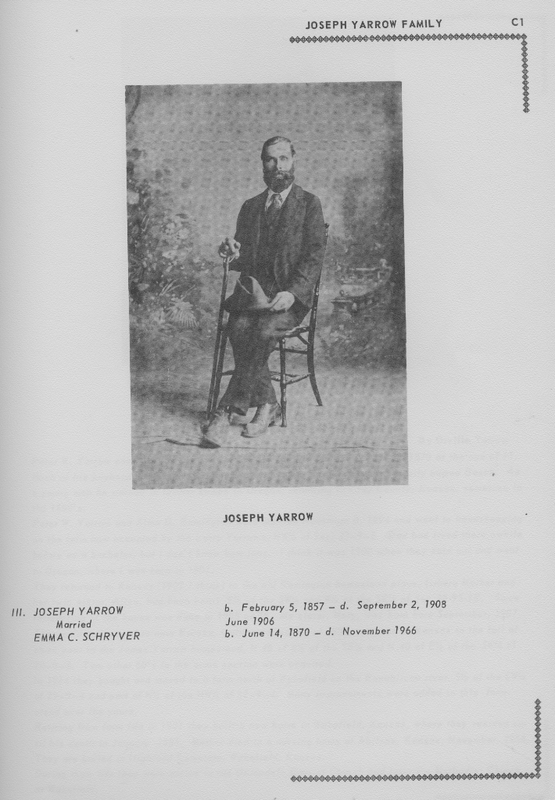 History by Peter Yarrow's grandson Orville Yarrow. 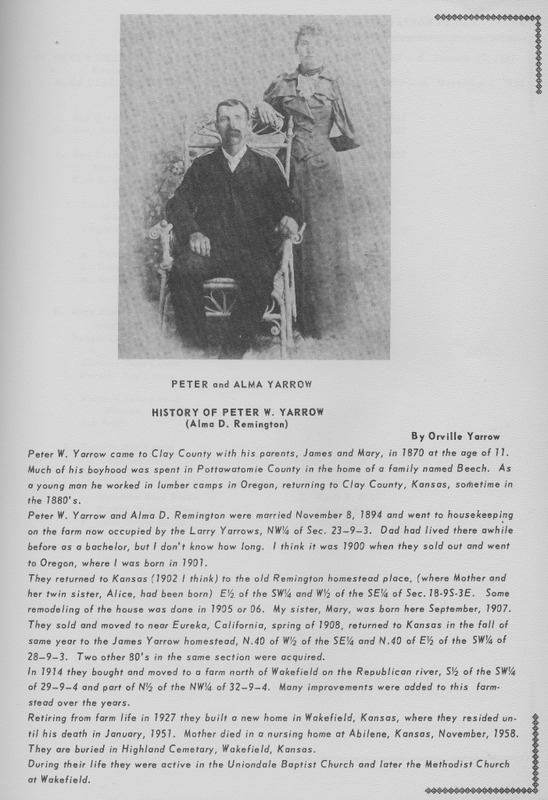 Peter William Yarrow was born in Henham Essex in 1859, in 1870 he moved to Kansas with his pareas ants James and Mary Yarrow at the age of 11. Much of his boyhood was spent in Pottowatomie County in the home of a family named Beech. As a young man he worked in lumber camps in Oregon returning to Clay County, Kansas sometime in the 1880's. Peter Yarrow married Alma D. Remington on 8 November 1894 and went to housekeeping on the farm now occupied by Larry Yarrow. 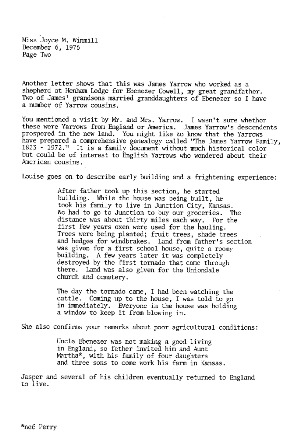 Orville Yarrow writes dad lived in the homestead of Larry Yarrow when he was a bachelor, it was around 1900 when the Yarrow's sold up and went to Oregon, where Orville was born in 1901. 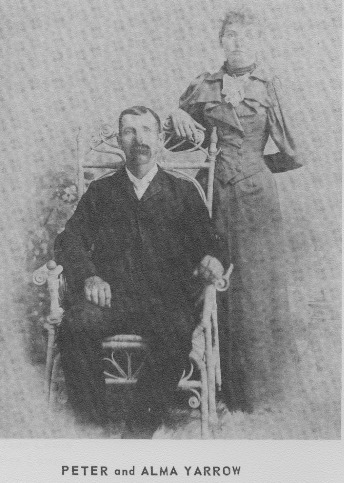 The family returned to Kansas around 1902 to the Remington old homestead where Orville's mother and her twin sister Alice was born. Around 1905/06 the house was remodelled and Orville's sister Mary was born there in September 1907. 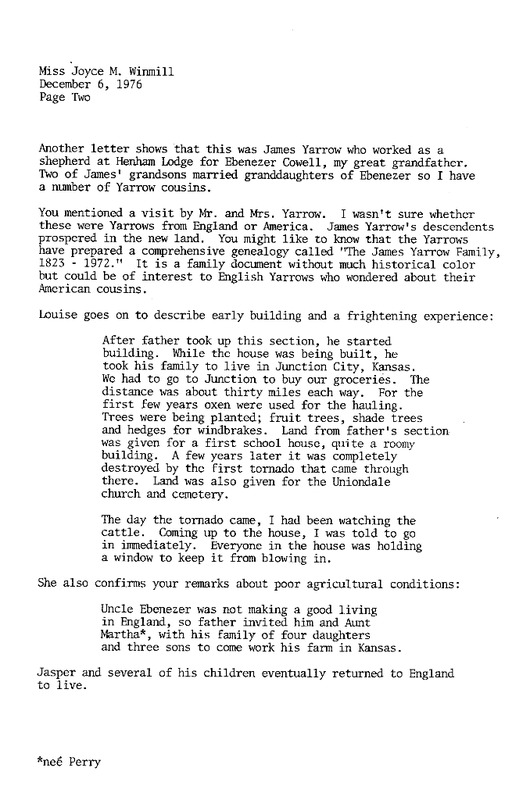 The family sold up and moved to Eureka, California in the spring of 1908, returning to Kansas in the autumn to James Yarrow's homestead. 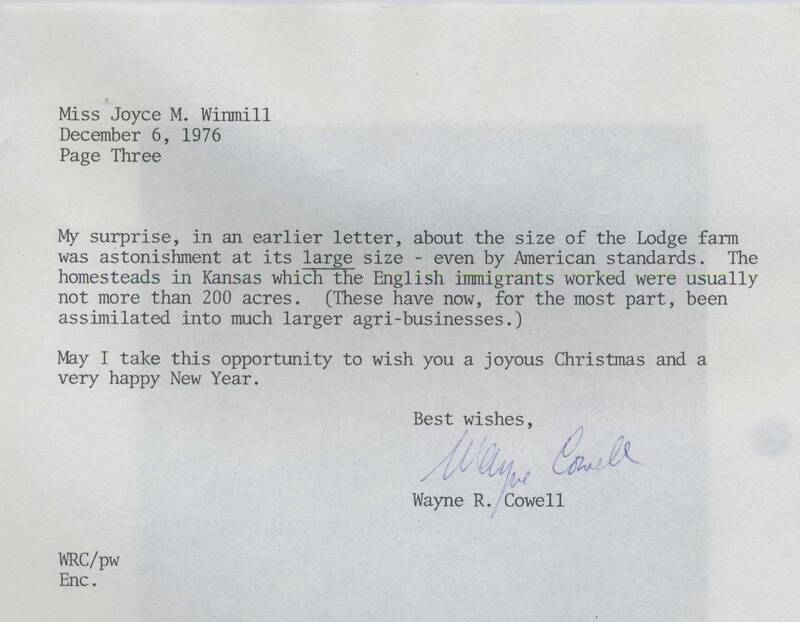 In 1914 they bought and moved to a farm north of Wakefield on the Republican river. Many improvements were made over the years to this farmstead. Retiring from the farm in 1927 they built a new home in Wakefield, Kansa where they resided until his death in January 1951. Mum died in a nursing home at Abilene, Kansas November 1958. They are buried in Highland Cemetary, Wakefield, Kansas. 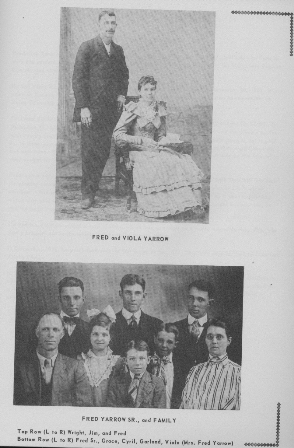 During their life they were active in the Uniondale Baptist Church and later the Wakefield Methodist Church.